Black African Pattern Vinyl - Printed heat transfer vinyl that could be used for indoor or outdoor. Heat transfer vinyl (HTV)- For garments, shirts, fabric, etc. Includes FREE Transfer Paper! Great for Cricut & Silhouette Machines! Read below for heat transfer application instructions. Suitable for cotton, polyester, acrylic and similar fibers. Vinyls are not reusable. Heat Transfer Vinyl Directions 1) Heat press - Cut pattern side and weed excess material. 2) Apply heat transfer tape to top of design, squeegee (included), remove backing and place on garment. 3) Heat press at 320 degrees for 15 seconds with medium to heavy pressure. 4) Peel transfer tape hot within 5 seconds. 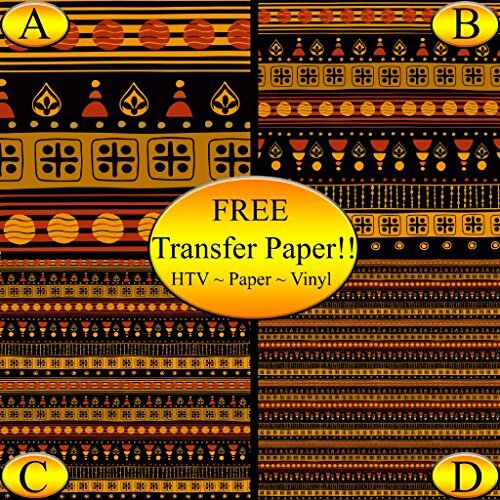 Black African Pattern Heat transfer vinyl (HTV) - For garments, shirts, fabric, etc. Great for Cricut & Silhouette Machines! If you have any questions about this product by American Sign Letters, contact us by completing and submitting the form below. If you are looking for a specif part number, please include it with your message.